Standardized uptake value (SUV) is an advanced tool for quantitative tumor identification and metabolic target volume delineation (TVD) in diagnostic and therapeutic settings. It is thus important to establish a quality assured process to maintain the traceability of data correctly by positron emission tomography (PET) systems. Patient administration of 18 fluoro-deoxy-glucose is increasingly delivered by automated infusion systems (AISs). Whenever AIS is used, its accuracy and traceability measurement need verification. In addition, it was observed that the unreproducible SUV displayed in PET and the treatment planning system (TPS) may cause grave concerns for radiation oncologists for TVD. This concern may complicate the correlation of TVD on PET and TPS and their clinical reporting. The SUV traceability was established from the PET system to AIS. Its accuracy was verified by cross-referencing to the reference dose calibrator traceable to a primary standard. The SUV values were converted in TPS using the in-house "clinical tool" to be identical as in PET, to allow radiation oncologists to use SUV confidently. The outcome of this study enables the clinical groups to rely on the correct SUV values displayed on the TPS and to improve the quality of care for patients in clinical procedures. SUV is calculated as shown in equation 1.
where Act vol is the radioactivity concentration in any volume of interest and Act admin is the total amount of radioactivity administered to the patient. In this study, the lack of a traceable calibration system for 18 F was identified. This issue, however, is often neglected in diagnostic and therapy health-care centers despite using multiple clinical devices independent of each other. The traceability to reference instruments would then become a requirement for ensuring the accuracy of SUV for diagnostic and therapeutic procedures. "SUV traceable" is the SUV of an accurate measurement and traceable to primary standard for a structure at any given time by definition and shown as SUV traceable, in this study. Moreover, the traceability of the systems shall be maintained across the range of instruments when assaying or quantitatively calculating the 18 F activity directly, or indirectly. Thus, using automated infusion system (AIS) was deemed important, to be verified by cross-calibrating its internal dose calibrator to the reference dose calibrator. The traceable AIS will provide the correct SUV in our hospital. It is our standard procedure to inject patients with AIS; therefore, the SUV figures in our TPS need to be standardized and streamlined. The SUV value was verified by preliminary assessment of AIS, which was found to be non-traceable and unreliable. The findings were reported to the vendor when further service and upgrades on AIS proved to be beneficial where the AIS operation became optimized. To make matters more challenging, it was further observed that Pinnacle™ (Philips Medical Systems, CA, USA) TPS was unable to interpret the SUV correctly from the Digital Imaging and Communications in Medicine (DICOM) images corresponding to a traceable PET. Therefore, the objective of this study was to disseminate the SUV traceability of an established, calibrated PET instrumentation that is traceable to primary standards, and to develop a method to display correct SUV values in the TPS for accurate TVD. The PET/computed tomography (CT) scanner model used in this study was the Philips Gemini TF (Generation 3). It was calibrated and made traceable to National Institute of Standards and Technology (NIST) applying the methodology presented by Montgomery  and also employed concepts used in National Physical Laboratory  and Australian Standard Laboratory  works previously presented. All cross calibrations were verified using a NIST-traceable solid 68 Ge source as a 18 F surrogate. 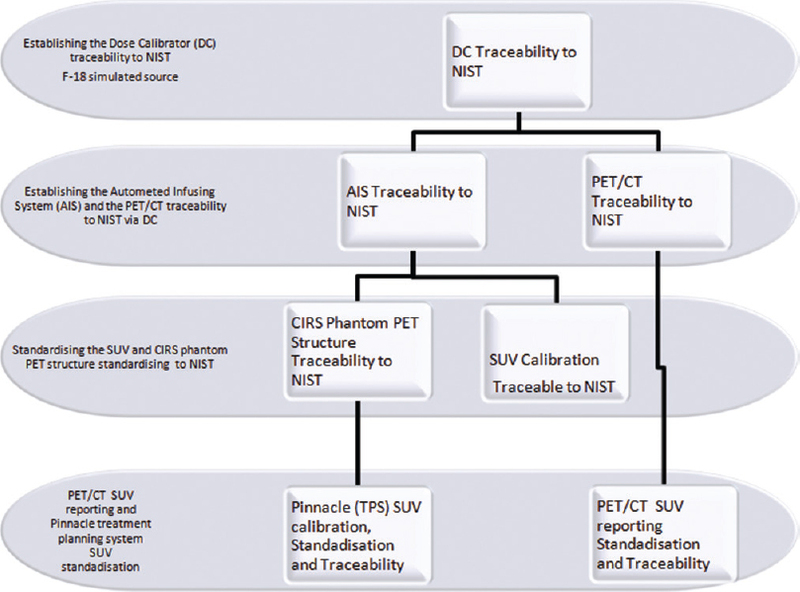 The traceability of the PET/CT to NIST and its relationship to clinical reporting in imaging and TPS is demonstrated in [Figure 1], which highlights the traceability process to link the NIST properties of the dose calibrator which propagates its reliability directly to AIS, PET scanner's SUV, TPS, and clinical reporting of SUV. The AIS comprises of a vial pig, suction needle, dispensing line and coil, an injection line, a disposal line, an internal dose calibrator, and a saline bag. AIS gets primed with saline for air removal from all lines before injection. It then samples a small amount of 18 F activity concentration knowing the total vial volume and its calibrated activity entered at dispensing. Then it measures the sample in its internal dose calibrator system. Once it passes the concentration test, it draws up the rest of the activity to top-up the required amount as prescribed. Next, it adds saline of approximately 35 ml for patient injection. Once it injects the patient with activity, it disposes of the remnant waste through the waste line. The net activity injected by the AIS is therefore defined with the following equation. where A(patient) represents the radioactivity administered to the patient, A(sample) is the tested concentration activity measured by internal dose calibrator, and A(top.up) is the amount required to make up the prescribed dose. A(waste) represents the amount disposed of in the leftover of the line of injection. Observations were made to monitor the accuracy and consistency of the AIS at the time of commissioning and spanning over three annual quality assessments. It was noticed that there were significant errors in the prescribed and the received radioactivities to the patient (up to 20%). However, through several parts and software upgrades, the improvements were brought to within acceptable limits of 3% cross-referencing dose calibrators. A consistency test was conducted for a 50 ml syringe, where it was used to collect the AIS's patient injections, to cross-calibrate the internal dose calibrator of the infusing system and the reference dose calibrator. The AIS was assessed using randomly selected radioactivities for injections in the range of 37-200 MBq of 18 F.
The Philips SUV phantom was used according to manufacturer's instruction to calibrate the SUV baseline using SUV phantom, for clinical PET instrumentation normalization. A 1:1 ratio of the radioactivity in each CT slice volume was measured and compared to that of dose calibrator using the built-in software. The SUV calibration ensured that the PET/CT scanner has a 1:1 relationship to NIST traceable reference source; hence, the scanner itself is NIST traceable. , The phantom was filled using a manual injection method assayed in the reference dose calibrator. The Pinnacle TPS displays the pixel values or activity concentration calculated from the stored pixel values and its associated DICOM tags as shown in equation 3.
where U is the activity concentration of each voxel, m is the rescale slope, SV is the stored pixel value, and b is the rescale intercept as defined in the DICOM standard. The value of b is set to 0 and m to 1 for the PET images in Pinnacle. Thus, it is possible to retrieve the actual SUV values by modifying the rescale slope " m" in the Pinnacle TPS. This process is shown in [Figure 2]. The results for AIS cross-calibration with reference dose calibrator is shown in [Table 1] which displays the activity dialed on AIS, as prescribed to a patient, and displayed on printed AIS injection label, after delivery. It also shows AIS radioactivity measured by reference dose calibrator to record comparisons in PD%, for displayed and measured activities. The SUV figures in PET and Pinnacle consoles from randomly selected patients were recorded, and their constant median ratio of 5.23 was obtained and given in [Table 2] before applying the "clinical tool" corrections. This value corresponds to Activity Concentration Scale Factor 5.222854, given in PET phantom studies listed in [Table 3]. The combined uncertainty of fluorine-18-deoxyglucose activity injected into patients using the AIS is provided in [Table 4]. Quality performance monitoring period used records from July 27, 2013, to July 27, 2014; absolute difference of assaying a traceable 18 F simulated source to NIST was demonstrated in this section. The detailed information regarding the DICOM tags used in Pinnacle and their values in DICOM header for each PET insert employed in the CIRS phantom as radiotherapy structure is provided in [Table 3]. These tags are further explained in [Table 5], explaining Rescale Unit, Rescale Slope, SUV Scale Factor and Activity Concentration Scale Factor. 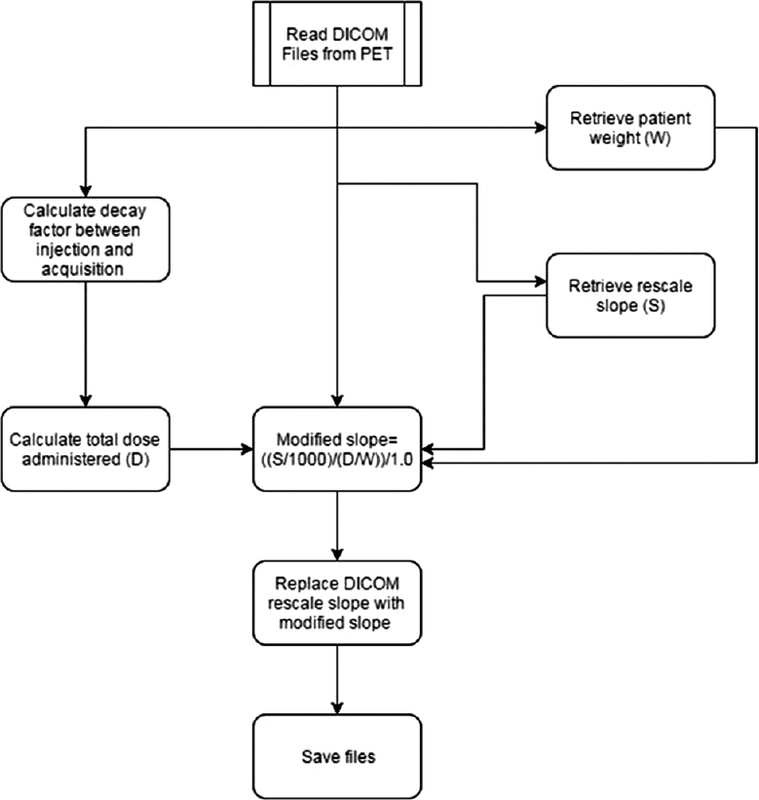 A flowchart was developed to manage the Python scripting demonstrated in [Figure 2], after studying the Pinnacle DICOM conformance and how the SUV is calculated in PET console and the requirement as how to interpret the PET SUV in Pinnacle. The logic of using a plugin script in Python was to enable the steps required to calculate the correct SUV in Pinnacle that is calibrated and traceable to PET. 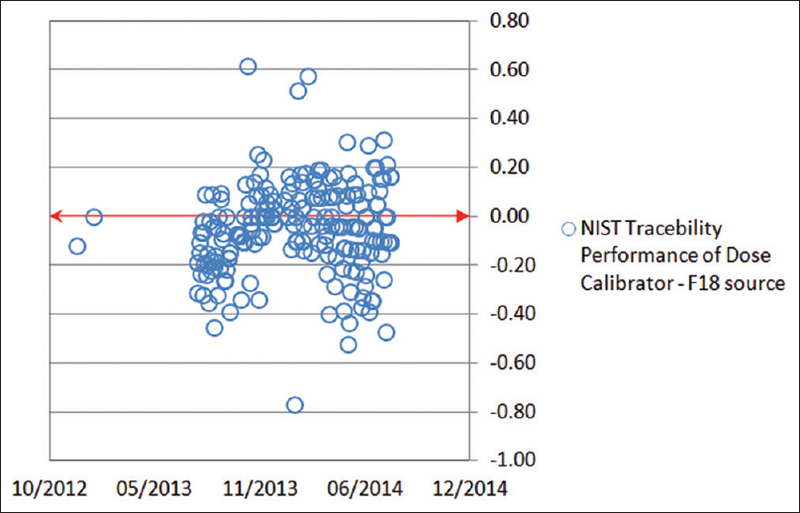 NIST traceability of dose calibrator performance with respect to the NIST 18 F simulated reference source is shown in a distribution chart in [Figure 3], where the precision and frequency of dose calibrator performance is highlighted. PET-fused images of CIRS Phantom with 8 mm PET insert were viewed in PET and Pinnacle consoles. After running the script, the Pinnacle SUV traceability to PET images was found to be identical. They both now represent the same SUV max . The SUV traceable was thus verified as shown in [Figure 4]. This study identified two significant points. It revealed the importance of establishing and maintaining the measurement traceability of the radioactivity assaying instruments (e.g., dose calibrator and AIS where applicable) whose accuracy would have a direct impact in the calibration of the PET/CT console and the quantitative values used for diagnostic and treatment planning purposes. Secondly, it has highlighted the inadvertent misinterpretation of SUV values by the planning system Pinnacle and proposed a method for correction. SUV is often assumed by clinicians to be a standardized quantitative value, used clinically in diagnostic and therapeutic aspects of patient management. However, it was found that health centers may be unaware of the traceability requirements, and their impacts on clinical outcomes. In this work, the need to have a national standardized SUV approach was also recognized, i.e., a national reference 18 F simulated source to be selected by Activity Standard Laboratory of Australian Nuclear Science and Technology Organisation and circulated to all PET centers to form 18 F traceability. A national approach will assure a calibrated standardized SUV to be employed in Australia. Further discussions on the possibility of vendor dependency of this study highlighted that other untested TPS platforms may not be reliable. Our local experience shows that the TPS Pinnacle had incorrect interpretations of PET SUV data generated from a Philips PET/CT console. Given that various PET systems may determine SUV in a different manner (e.g., using private DICOM tags) and hence the interpretation of that would result in nonmatching SUV in TPS, we believe it is worthwhile to consider assessment of different vendors' combinations of PET/CT console and TPS similar to this study. Our physicians have already expressed interest in standardizing and using our methodology for future clinical effectiveness to liaise with two other health centers. Their interest is due to improved clinical efficiency and reliability in SUV max figures. Work is already under progress for developing functional imaging based TVD. Boellaard R, Oyen WJ, Hoekstra CJ, Hoekstra OS, Visser EP, Willemsen AT, et al. The Netherlands protocol for standardisation and quantification of FDG whole body PET studies in multi-centre trials. Eur J Nucl Med Mol Imaging 2008;35:2320-33. Park YK, Park S, Wu HG, Kim S. A new plan quality index for dose painting radiotherapy. J Appl Clin Med Phys 2014;15:4941. Munley MT, Kagadis GC, McGee KP, Kirov AS, Jang S, Mutic S, et al. An introduction to molecular imaging in radiation oncology: A report by the AAPM Working Group on Molecular Imaging in Radiation Oncology (WGMIR). Med Phys 2013;40:101501. Boellaard R, O′Doherty MJ, Weber WA, Mottaghy FM, Lonsdale MN, Stroobants SG, et al. FDG PET and PET/CT: EANM procedure guidelines for tumour PET imaging: Version 1.0. Eur J Nucl Med Mol Imaging 2010;37:181-200. Bellan E, Ferretti A, Capirci C, Grassetto G, Gava M, Chondrogiannis S, et al. A new methodological approach for PET implementation in radiotherapy treatment planning. Nucl Med Commun 2012;33:516-20. The Role of PET/CT in Radiation Treatment Planning for Cancer Patient Treatment IAEA. Vienna: IAEA-TECDOC-1603 IAEA, 2008 Printed by the IAEA in Austria; October, 2008. Available from: http://www-pub.iaea.org/MTCD/publications/PDF/te_1603_web.pdf. [Last accessed on 2016 Nov 14]. Ben-Haim S, Ell P. 18F-FDG PET and PET/CT in the evaluation of cancer treatment response. J Nucl Med 2009;50:88-99. Montgomery D. Establishing the traceability of radioactivity standards to the National Institute of Standards and Technology (NIST). J Radioanal Nucl Chem 1998;233:21-4. Judge S. A review of UK requirements for a measurement infrastructure for radionuclides used in positron emission tomography, 1 st ed. Teddington: National Physical Laboratory; 2004. Digital Imaging and Communications in Medicine (DICOM), Information Object Definitions, PS3.3-2011, National Electrical Manufacturer′s Association, Rosslyn, Virginia 22209 USA. Available from: http://dicom.nema.org/Dicom/2011/11_03pu.pdf. [Last accessed on 2016 Nov 14]. National Electrical Manufacturer′s Association-NEMA. Digital Imaging and Communications in Medicine (DICOM), Information Object Definitions; 2011. Available from: http://dicom.nema.org/Dicom/2011/11_03pu.pdf. [Last accessed on 2016 Nov 14]. DICOM Conformance Statement. 1. DICOM Conformance Statement: Pinnacle3 Radiotherapy Treatment Planning System R9.8, Document Number: DHF181911; 2013. Available from: http://www.incenter.medical.philips.com/doclib/enc/fetch/2000/4504/577242/577256/588723/5144873/5144488/5144684/Pinnacle3_Radiotherapy_Treatment_Planning_System_R9.8.pdf%3fnodeid%3d10127505%26vernum%3d-2>. [Last accessed on 2016 Nov 14]. DICOM Conformance Statement. Gemini DICOM Conformance Statement Gemini PET/CT v3.5 or 3.6; 2010. Available from: http://www.incenter.medical.philips.com/doclib/enc/fetch/2000/4504/577242/577256/588723/5144873/5144488/5144390/DICOM_Conformance_Statement_GEMINI_R3.5_R3.6.pdf%3fnodeid%3d6404878%26vernum%3d-2. [Last accessed on 2016 Nov 14].